For use in shower-only installations with arched showerarm for increased rainhead clearance. 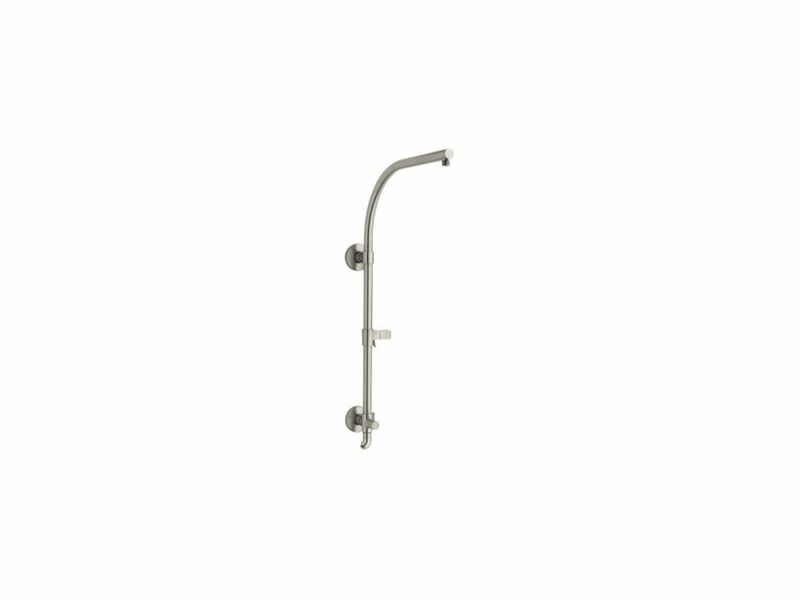 A welcome addition to any charming bathroom, this chrome rectangular shower rod works especially well with traditional claw foot tubs. It includes a 30" ceiling and 12" wall extension rod for easy installation. Also available in store by special order only see store for details. The Veer pedestal combines crisp, sophisticated style with a functional design that's perfect for smaller bathrooms. The slender column pedestal takes up minimal space, and pairs beautifully with the coordinating Veer sink basin for a stylish, affordable solution. Hydrorail 27-1/2 Inch H Shower Column In Brushed Nickel HydroRail-R allows you to easily upgrade a standard shower to a spa-like showering experience with luxurious overhead rain and handshower functionality. It's designed to accommodate a wide array of shower configurations without altering in-wall plumbing, making it suitable for both remodels and new construction. This shower column converts your single-outlet showerhead into a two-outlet custom showering experience, and has a slidebar bracket for easy height and angle adjustments to your handshower. For smooth toggling between handshower and rainhead functions, this column features a diverter conveniently located at the base. Hydrorail 27-1/2 Inch H Shower Column In Brushed Nickel is rated 5.0 out of 5 by 1. Rated 5 out of 5 by ldr1ray from Great product . . . even better service. I have been looking to upgrade our shower for quite some time, but like several folks, I am a novice DIYer. This product allowed me to do the install myself without modification to the existing tile work in our shower. Basically drill four holes into the tile and I was all set. The other point I want to make is that this product did NOT come with the shower hose as stated in the product description. Home Depot stood by their product description and provided a gift card of the price difference. Good job Home Depot!